When I was seven I saw a picture of a little girl and a machine that I have never forgotten. The vivid incongruity between her and her surroundings gave me an uneasy sense of disproportion and wrongness. She was a child like all others—like me—but something was not right. Her eyes and shoulders showed deep fatigue and her ragged, dirty dress sagged on her frail, brittle-looking little body. All that mysterious metal in front of her was menacing but she reached to touch it almost casually–it was clear that she was familiar with the thing. She was not alone— a blurred figure hovered in the background—but she was isolated, her downcast eyes turned away from the light and focused on the machinery. Although I didn’t know exactly what I was seeing, intuitively I recognized that I was a witness to a thing that should not have happened. The picture was a striking glimpse of a realm of routine hurt and unfairness; it revealed a chronically vulnerable kid in a place where she did not belong. Lewis Hine took this photo and many others as he systematically documented exploited children in America from 1908-1912. Hine was an investigative photographer for the National Child Labor Committee and his pictures circulated widely as part of the Progressive movement to ban child labor. Hine’s vivid photos contributed significantly to this cause by revealing American child laborers to the public, and his legacy as a prominent, active, socially conscious artist is secure. That legacy includes the work of G. M. B. Akash, a photojournalist who is documenting living and laboring conditions for dispossessed people in India, Pakistan, and Nepal. Like Hine’s images, Akash’s photographs foreground big, rigid machines against small, soft children. And as with Hine, a sense of disproportionate scale and incongruous textures emphasizes the wrongness of such scenes. 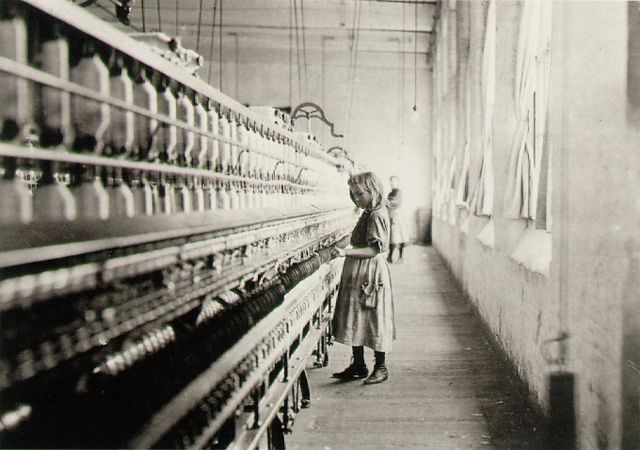 That sense of irreducible impropriety is amplified when the century-old photographs reverberate through their modern echoes: the problem of child labor has not yet been solved. Does this repetition of visual themes suggest that child exploitation cannot be eradicated? That the ills of industrialized labor will persist because of our human greed, thrift, need, and ignorance–and the mobility of capital? I take a more hopeful view. These pictures, photographers, subjects, and viewers are separated by continents and a century, but images in this style have not lost their power to establish connections across profound social, geographic, and temporal distance. Such exploitation thrives when it is hidden, so exposing it is a crucial step to fighting it, but the mode of exposure also matters. Not all pictures of child laborers are equally powerful, and Akash’s repetition of established masterworks is a strong strategy. Echoes of Hine’s photos visually spotlight similarities between casualties of the second Industrial Revolution in Vermont and the global economy in Bangladesh. Concerted progressive activism helped in the first case. Those same efforts are called for now. Photographs by Lewis Hine, 1908-1909 (estimated) and G. M. B. Akash, 2009. Megan Bernard is a graduate student in the program in Rhetoric and Public Culture, Department of Communication Studies, Northwestern University. She can be contacted at megan@northwestern.edu. Good post, Megan. 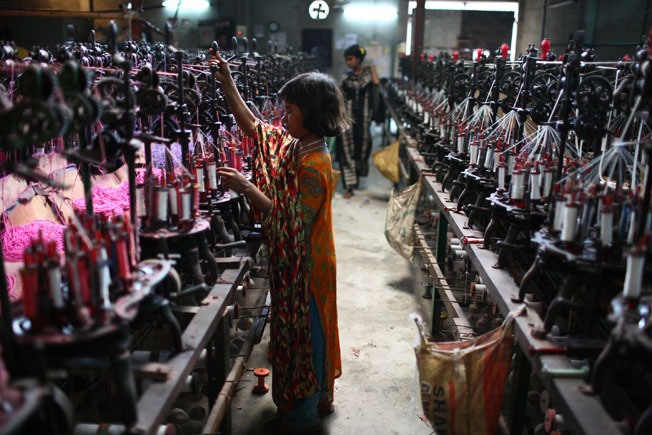 The Hine photograph seems to capture, with its black and white dullness and the supervising body in the background, a more bleak scene than the Akash photograph, where it seems that nobody (in South Asian factories) is watching. The person in the background looks young enough to even be another child laborer, going about her business just the same–no supervisory role. On the other hand, the Akash repetition of the machine is more striking, since each colorful spool symbolizes yet another task for the child to fulfill. The bottling (?) factory just looks massive and bewildering. Both, like you say, are very effective arguments in their own, parallel way.